We had quite a morning.. All 3 of our kitties had their annual check ups at the vet today. They were a few weeks overdue for their shots, and with the crazy school schedule starting next week I wanted to get in before that happened. I also wanted to go when I had extra hands to help, since I was taking in 3 kitties at once. One thing they check at the appointment is a "sample from what comes out of a cat". Since we are a multicat household, they just take a family sample because unless you are at the box at the time, its impossible to tell what belongs to who. They gave me plastic contatiner, and I put it in my purse without looking at it. When I got home I was surprised to see a tootsie roll and some cat treats inside. I have taken cats to to the vet for years, and have never had a tootsie roll in the contatiner before. I called the vet's office just to see if I was to do something special with that tootsie roll. The vet tech just laughed and said that it was a treat for me. It was also a bit ironic that the name on the container was our gray cat in the 1st picture. Her name just happens to be named Tootise. I had to admit, it was pretty funny. Updates on the frogs.. The frogs were doing great in their habitat the last few days, that it until this morning. When I came downstairs I noticed a lot water all over the kitchen floor, and a funny smell. Then I saw what was causing that water and smell. One of the cats had knocked the habitat off the counter and it had landed upside down. We have found 2 of the 3 frogs and let them free back outside. We have no idea where the 3rd and smallest frog is, we are hoping it is not in a cat belly. At the moment my house smells like a pond.. Ewww!!! I need to mop the kitchen floor ASAP. I did not have time before we left for the vet appt. Since I heard many good things about the Canvas People deal that I posted about yesterday, I decided I wanted to give it a try. I could not find a certain picture from when the kids were little that I wanted to use, but I did come across another one of my favorites. 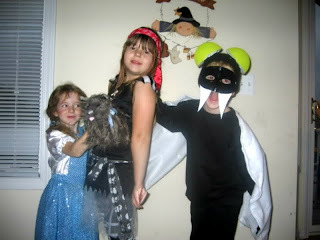 This was taken Halloween 2006, and all three of the kids are smiling and having fun. I cant wait to see how it turns out!